Ziziphus. (From Arabic zizouf, the name for the lotus fruit of aniquity (Ziziphus lotus)). Rhamnaceae. 86 species of woody, perennial, deciduous and evergreen shrubs and trees to 10m, most with stipular thorns (one straight, one recurved). Leaves alternate-distichous, on short petioles, vein pairs 3-5, margins entire to serrate. Inflorescence on axillary cyme; flowers 5-numerous, yellow, usually hermaphroditic; style bifid, ovary usually 2-locular. Fruit subglobose to oblong. Widely distributed in tropical and subtropical areas, with one Mediterranean species and one from temperate Asia. Cultivars of Ziziphus jujuba, long grown for their excellent dessert fruits, make attractive deciduous specimens for warm temperate and subtropical climates, fruiting in their third or fourth year under favourable conditions (hot dry weather is required for good fruiting). Ziziphus mauritanica, smaller and better adapted to humid climates, is also suited to hot, dry conditions and will tolerate temperatures to -5ºC when dormant. In zones that experience prolonged or severe frosts, Ziziphus species grown for fruit need protection of the cool to intermediate glasshouse. Ziziphus jujuba may be grown as an ornamental where temperatures fall as low as -20ºC. Grow in any well-drained soil, including limy soils, in sun. Under glass use a medium-fertility loam-based mix, maintain good ventilation and fairly low humidity; water moderately when in growth, and keep almost dry in winter. Prune when dormant in winter, fruit is carried on the current season’s growth. Under natural conditions Ziziphus jujuba forms a deep and substantial taproot, limiting its usefulness as a pot-grown specimen. Cultivars are sometimes grafted on to Ziziphus rotundifolia which limits top growth; with careful feeding and watering specimens thus treated may be more amenable to tub cultivation. Propagate by seed, sown in gentle heat after removal of the fleshy and hard outer shell. Prick out seedlings into individual pots on formation of four true leaves. Increase cultivars by grafting. Ziziphus jujuba may be increased by root cuttings. COMMON JUJUBE; CHINESE DATE; CHINESE JUJUBE. Shrub or tree to 9m, with flexuous twigs, spines mostly curved, straight ones to 3cm. Leaves 2.5-6cm, oval-lanceolate to elliptic, apex rounded to obtuse, leathery, glabrous, margins crenate; petioles 1-5mm. Flowers in axillary clusters of 2-3, yellow. Fruit 1.5-2.5cm, ovate, dark red, later black. Temperate Asia, frequently naturalised elsewhere. Z6. ‘Lang’: fruit small, sweet, melting flesh, tree large, early-bearing. ‘Li’: fruit very large, tree large. ‘Sherwood’: fruit very large. ‘Silverhill’: fruit large, elongated, sweet, good for drying. ‘Silverhill Round’: fruit large, plum-shaped, very sweet. 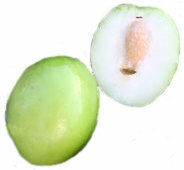 INDIAN JUJUBE; COTTONY JUJUBE. Shrub or small tree to 6m, usually evergreen, twigs and leaves (beneath) white or rusty-brown tomentose. Leaves to 8cm, broadly elliptic, apex rounded, stipular spines stout. Fruit to 2.5cm diameter, globose to suboblong, acidic. India, naturalised elsewhere. Z10.